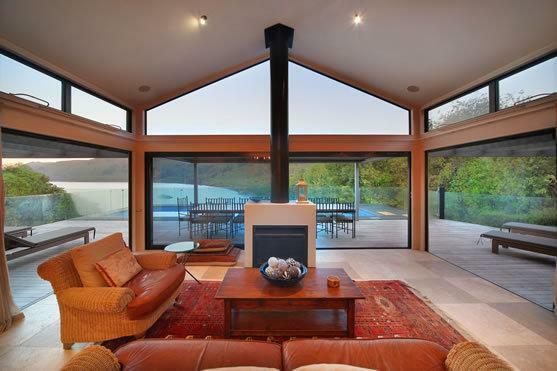 This stunning villa located on the northern shores of New Zealand's spectacular Lake Taupo, within an exclusive estate, Villa 661 offer couples, families and friends a luxurious haven from which to discover the delights of this astounding natural wonderland. 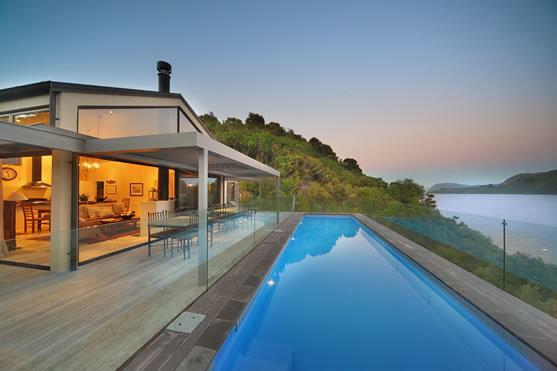 The Villa has been cleverly designed to blend with the natural surroundings, whilst the spacious 1,900 sq. ft. interiors offer guests maximum pleasure and relaxation, as they take in the surrounding native bush, prolific bird song, and beautiful blue-green waters of Mine Bay. The villa is elegantly furnished with oak furniture, Seagrass and leather lounge suites and original local artwork. 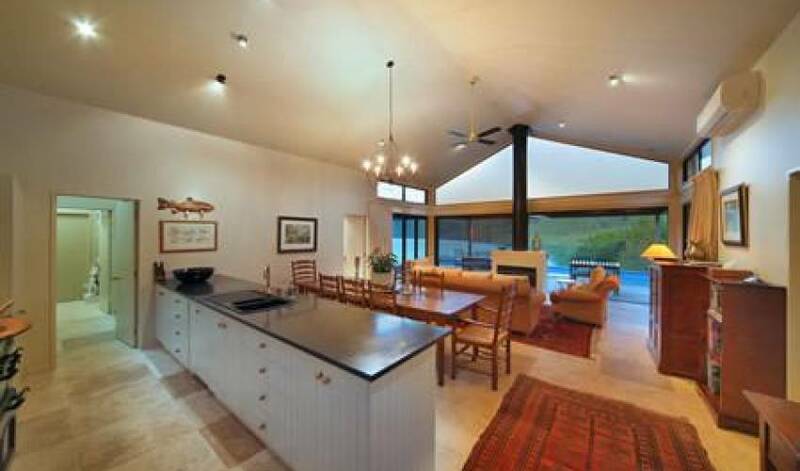 The spacious open living and dining areas lead onto large private decks and terraces. 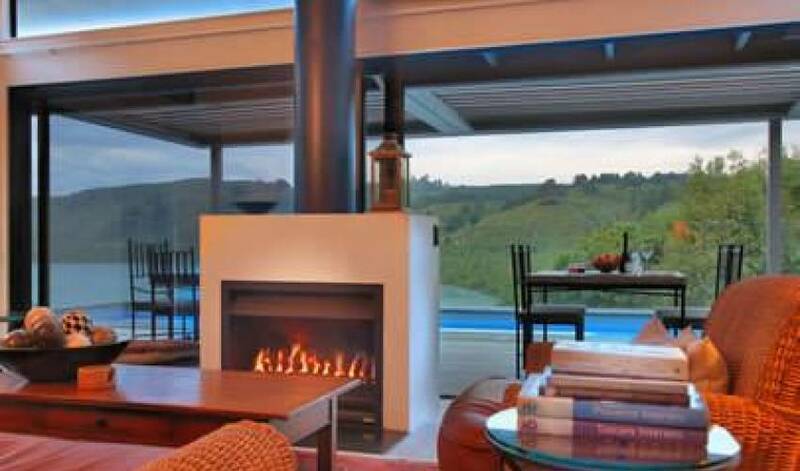 There are state-of-the-art audio-visual entertainment systems, an open gas fireplace for winter warmth with barbecue and outdoor furniture to enjoy the warmer weather. Accommodating up to two couples or a family of four, the villa features two master bedrooms with super king-sized or twin king beds. on offer are down duvets & pillows as well as a T.V. and C.D. 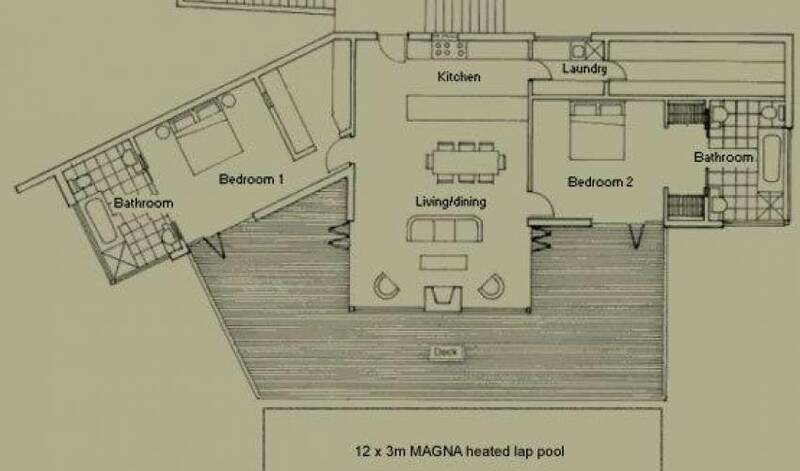 player in three of the four bedrooms. These large bedrooms open into glorious Italian travertine and double-glazed glass bathrooms that give guests a sublime sense of bathing outdoors amongst New Zealand's native bush. Each villa also boasts a beautifully appointed kitchen equipped with the finest European appliances that will delight the keenest culinary expectations. The pantry and fridge are stocked with the basics for cooking, so whether you self cater, pre-order all your provisions or choose full catering using the talents of our world-class chef, all is on hand. And when the mundane must present itself, each villa has a full laundry, or a valet service option is available on request if preferred. 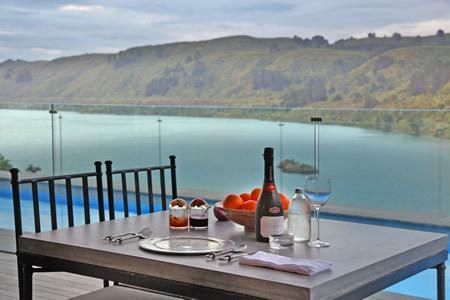 If guests require only villa, Villa 661 offers uninterrupted views of the lake and a 12 x 3 metre MAGNA lap pool off the front deck. 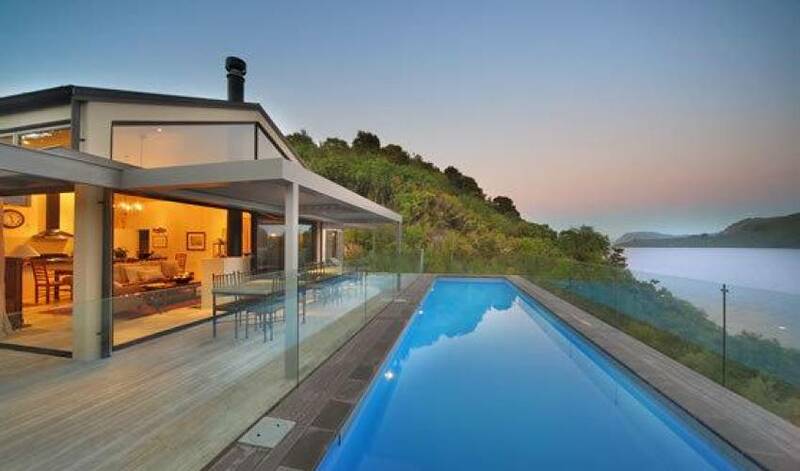 The Point Villa's have onsite management but privacy is assured. 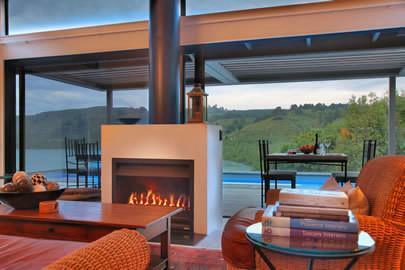 Villa 661's large living area faces the lake and extends out to a terrace and deck with views across the lake. 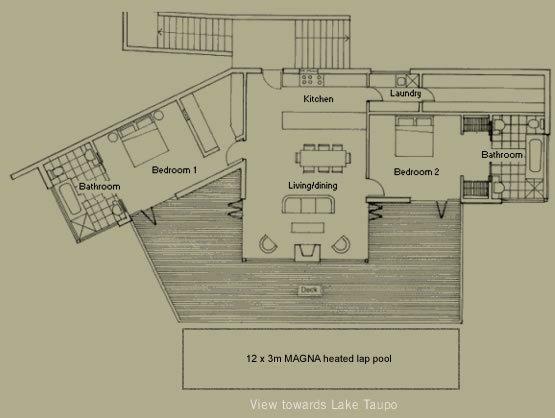 The spacious bedrooms and bathrooms are positioned on either side of the living area and open out onto the bush and the bay beyond. Its sunny aspect creates a warm and friendly environment. Guests have a choice of self-catering, or pre-ordering all provisions and having them delivered to your villa, or choosing a fully-catered service using the talents of our first-class chef. The choice is yours. One day enjoy being the chef, the next be pampered and waited upon! Depending on your needs, we work closely with the local Yum Food Company, owned by award-winning chef Prue Campbell. Yum Deli offers lunch and gourmet dinner options, Allpress coffee as well as speciality foods and a delicious continental gourmet breakfast basket that can be delivered to your villa. Yum Cook School offers regular classes that cater for different levels and styles of food to suit all budding chefs. Yum Catering delivers divine food for all occasions, from small degustation dinners to weddings. Guests can pre-order a list of groceries which are delivered to the villa prior to arrival. This option is for those who wish to self cater but not have to bring in supplies. This may simply be for breakfast provisions or for all meals. The groceries will be charged at cost plus a NZ$50 handling and delivery fee. A meal is delivered, ready for final preparation by the guest. All the ingredients have been purchased and prepared. Detailed cooking instructions will be included for the chosen menu. Guests can choose a fully catered service for all meals where by staff arrive in time to set a table, organise the kitchen, serve the meal and then clean up. Guests can discuss the menus provided by our chef prior to arrival so have the meal of their choice. Prodigious birdlife, the bush filled with Tui, Bellbirds and quail etc. 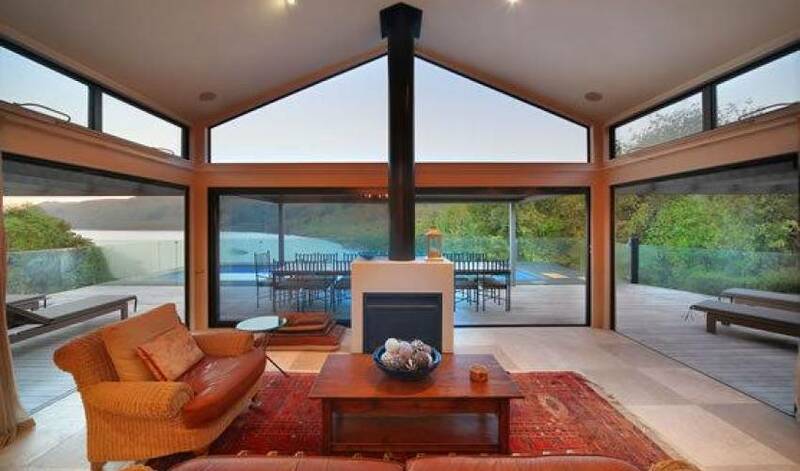 The Villa is located on Whakamoenga Point, set within 58 acres of native bushland and exotic plantings on the edge of spectacular Lake Taupo in the centre of New Zealand's North Island. 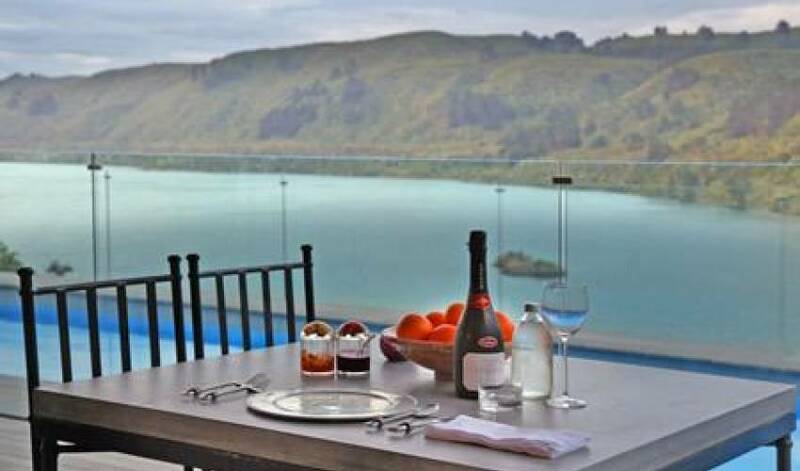 From your private terrace and deck enjoy these native forests and the changing hues and reflections of Lake Taupo's Mine Bay. Dramatic mountain views of Ruapehu, Tongariro, Ngauruhoe and Pihanga can be seen across the lake from the Estate. 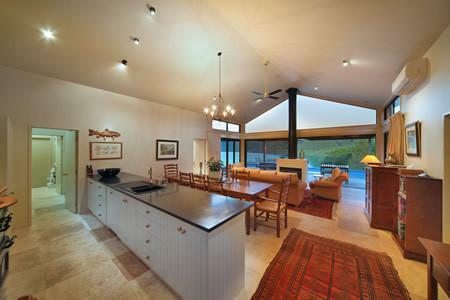 As the Villa forms part of the exclusive estate, with its full security access, and are only 10 minutes' drive from the thriving township of Taupo, guests enjoy both complete privacy and the convenience of being close to a myriad of public amenities and services. 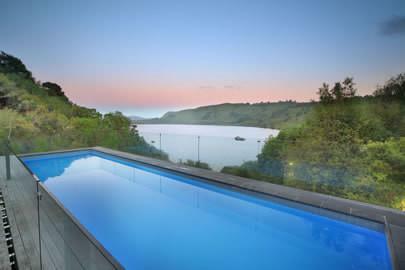 Villa 661 is a 3 hour drive south from Auckland or 4.5 hours north from Wellington. Alternatively, Air New Zealand have several daily flights from either Auckland or Wellington to Taupo. Rental cars and private charter flights can also be arranged. 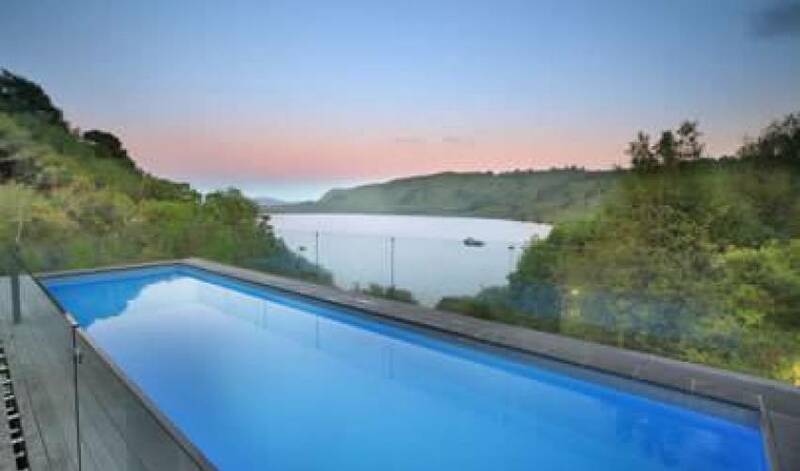 Drive to Acacia Bay on the western side of the bay from Taupo, pass the store and restaurant on the left, follow straight on into Wakeman Road and continue for approximately 5 minutes until you reach the security gates. This is approximately a ten-minute drive.